Producers & Engineers Wing Senior Executive Director Maureen Droney said, "The evening was a huge success, and once again we take the opportunity to offer a sincere thank you to all of our sponsors. It's a simple fact that we couldn't have done it without them. Quincy Jones's and Al Schmitt's careers represent powerful moments in music history, and it is especially gratifying that so many leading high quality brands joined together and shared the night with us. We all look forward to next year." Jim Odom, Co-founder and CSO, PreSonus Audio Electronics, Inc., added, "Supporting The Recording Academy Producers & Engineers Wing is a no-brainer for us at PreSonus; they're our people! I'm a voting member of the Academy, and with other members of our team in the P&E Wing, we couldn't imagine a better way to spend an evening during GRAMMY Week than to pay tribute to two of our heroes, Quincy Jones and Al Schmitt." 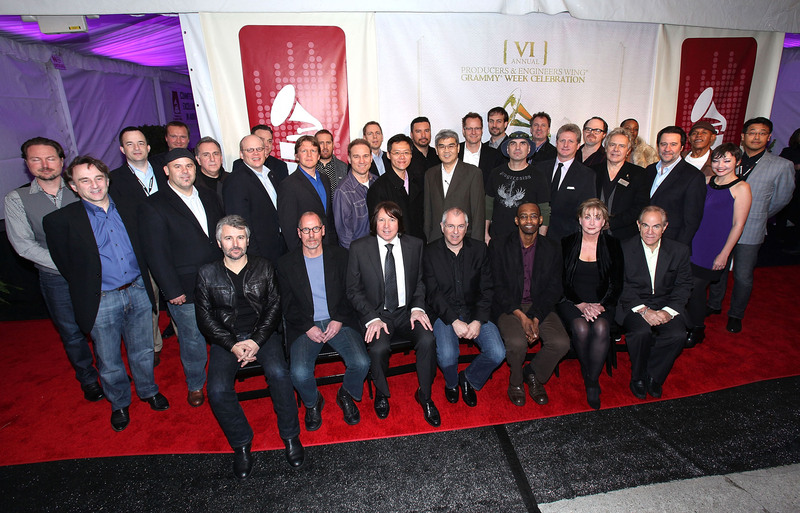 Photo Caption: Key sponsors and P&E Wing personnel gather for The Recording Academy® Producers & Engineers Wing®'s GRAMMY Week event, which this year honored Quincy Jones and Al Schmitt. Photo courtesy of The Recording Academy/WireImage.com/Maury Phillips. Photographed by Maury Phillips. © 2013.